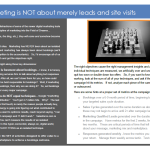 A few years ago, lead generation conversations began by talking about “going to market”. Today, we must also think in terms of “being in the market”. What do we mean? It means when prospects are out looking to solve their problems, they find your customers talking about your solutions; they find your blog detailing the problem and educating them on how to solve it in an informative manner, not only in a sales pitch. And most important, as potential prospects progress in their buying process, they get appropriate content from you. To do that requires an integrated program -a blend of inbound tactics like SEO, SEM and excellent content development as well as integrating outbound programs that help identify and adavnce them in the buying cycle. The combination of these efforts can yield great results, with email messaging feeding off of voice messages and conversations, reinforcing phrases that your organization ranks well for on search engines. By providing optimal touch points on the web to improve your conversion rates, and excellent specialists to qualify those prospects, you can generate real leads for your sales organization. You’ll find that advanced marketing automation software is a vital aspect of integrated marketing. It provides the comprehensive picture of all your prospects’ activities – visits to your website, responses to your emails, white paper downloads, webinar registration and attendance, etc. All of this information enables you to interact more efficiently, proactively, and on a cadence. Some responses can be automated via email. Others can trigger the appropriate representative to contact them. And to ensure a quality conversation, all the interactions to date are readily available. It’s also more effective because the knowledge of personas and buying cycle stage enable you to provide the right kind of information or interaction that will cause the greatest positive impact. Integrated marketing is not a campaign. It’s a process. It builds on marketing planning and strategy to create an ongoing program of integrated and sequenced tactics. We think of it as a “marketing stack” that enables your revenue engine just as the technology stack enables your business execution. Your most effective messages and themes are blended across a variety of tactics to drive the best possible results. To request more information, please fill out our form. Or visit our IB page to learn more about enabling better inbound marketing as a foundation for your future success.